It happens that after some specific periods of the year (i.e. Halloween) our body just begs for a purification from candies and sugar in general…. In my case that request is followed with not so much effort, considering that I love vegetable soup, and fortunately all my family does too- even the little ones! It’s a great way to get them to eat more veggies!So, whether you want to help rid your body of the sugar, or warm up with a hot bowl of soup on a cold autumn day, or get more veggies in your diet, just add this vegetable soup to your diet twice a week. Believe me, you’ll be amazed how much you will like this healthy meal! I was taught that when you cook vegetables, it is always better to use a steel pot or pan, because steel lets the vegetables cook without leaching all their precious properties. I always use a big steel pot, so I am sure to have enough soup to eat all week, and if there are leftovers, I freeze them. To cook the vegetable soup takes no more than 30 minutes, but you’ll need a little bit of extra time before, to chop the veggies. Start by washing and cutting all of your vegetables. I remove the peel of the carrot, potatoes, and squash, but leave the peel on the zucchini. Next heat about 2 tbs. of olive oil in the pot on medium heat. Add the leeks, and cook until browned. 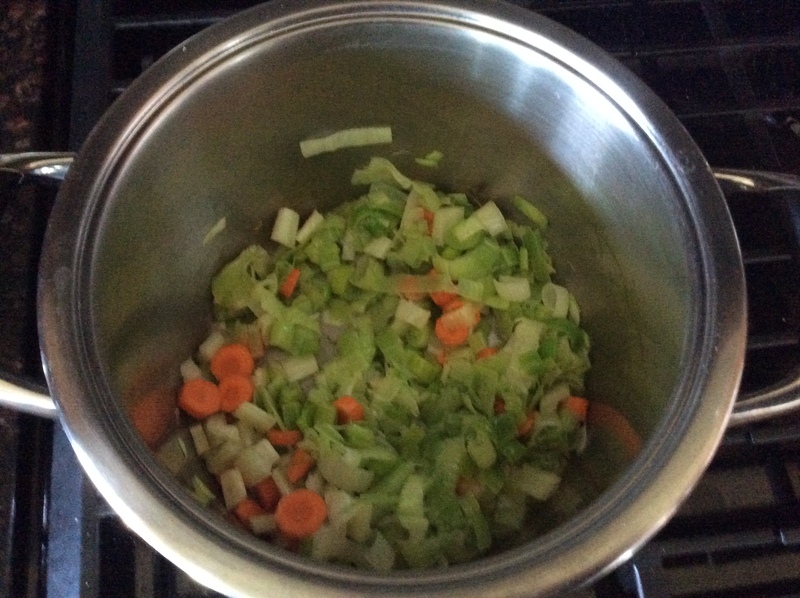 Then add the chopped carrot and celery and again wait a little until they brown with the leeks. Stir a few times. 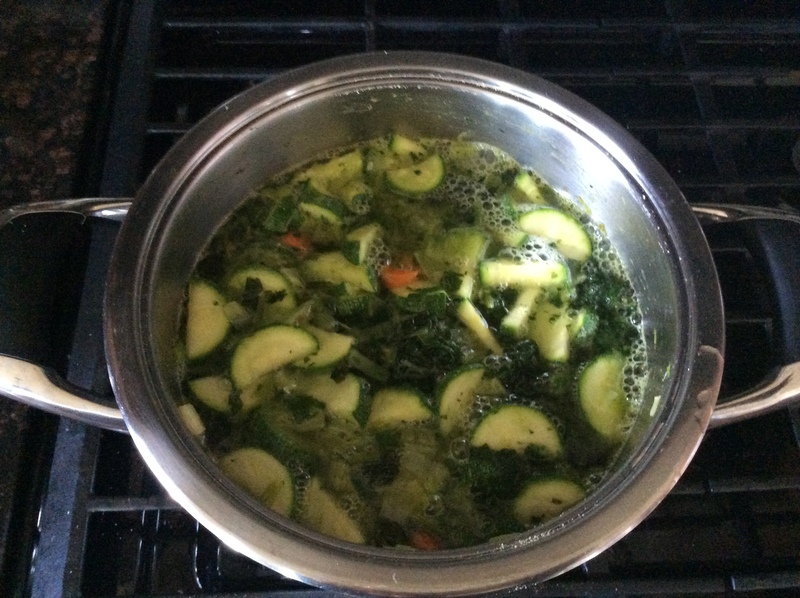 Then add the chopped zucchini, potatoes and butternut squash, spinach (or bok choy leaves), and the vegetable broth seasoning. Let the vegetables cook few minutes and then add to the water some salt and any other spices or herbs you think you would like to use. Cover the pot with the lid and as soon as the water starts boiling, put the pot at lower heat for not more than 30 minutes. TIPS: – What is really great about this soup is that you can make it anytime of the day, and just reheat it before your meal. – If you are following an “only protein” or “low carb” diet, you’ll find out that except for the potatoes (and the pasta or croutons, of course), the vegetables used in this recipe are all allowed! Considering that I eat a ton of vegetable soup especially in the cold seasons, I usually skip the use of potatoes, and prefer to add to my soup more zucchini or squash to make it more dense. – If kept refrigerated, your soup should last one week. I usually freeze it in small containers, so each time I can thaw just the quantity I need.